Burnley skipper Tom Heaton sees the new era with England as another opportunity to impress after the goalkeeper was named among Gareth Southgate’s first pool of players. Heaton, who received his first call up for his country from former manager Roy Hodgson in May last year, is once again one of three goalkeepers to be included in the squad alongside Joe Hart and Fraser Forster. The Clarets stopper, who has kept two clean sheets in the Premier League so far this season, earned his first cap in a friendly against Australia more than four months ago and he’s looking to build on that by making an impression ahead of World Cup qualifiers against Malta and Slovenia. Following Sam Allardyce’s departure, the 30-year-old said: “I don’t know Gareth particularly well but I’ve come across him a few times and he seems like a great guy. “He did a fantastic job with the 21s. I’m looking forward to taking as much as I can from him and working with him. Meanwhile, the former Manchester United trainee believes that Michael Keane’s inclusion in the Three Lions squad is thoroughly deserved after the defender replaced the injured Glen Johnson. With Keane travelling down to St George’s Park to team up with his international team-mates for the first time, Heaton said: He’s been outstanding. I’ve said all along at 23 playing in the Premier League at centre half, there’s not many of them. “He’s quick, strong, good on the ball. At that age there’s not many playing in the PL. He’s improving all the time. 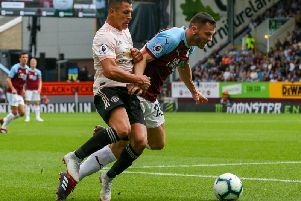 On the domestic front, despite the late drama against Arsenal at Turf Moor in the final action before the enforced break, Heaton feels that the Clarets are acquitting themselves well in their return to the top flight having accrued seven points from as many games. “I think we’re wiser to it,” he said. “We’ve been burnt a bit but we’ve learnt what it’s about. “You need to able to handle the ball at times and take the pressure off from defending, which we can do but you don’t want to defend for 90 minutes. “That’s one of the big learners. We’re looking to build and improve all the time. “We’ve got two wins on the board, that was important for us, and it was two excellent wins.